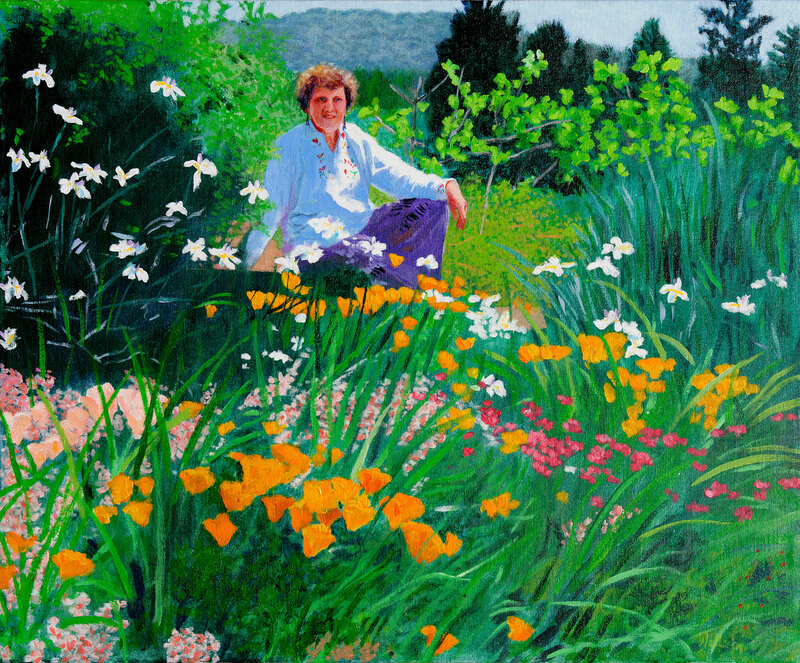 I have a display of landscape paintings currently on loan and displayed at the Santa Barbara Botanic Garden. Most of them are in the Pritzlaff Conservation Center and a few are in the volunteer cottage. My membership with the Santa Barbara Botanic Garden goes back 30 years, when I purchased property in Santa Barbara with my late wife, Bettine Kinney Wallin. Bettine was an avid gardener, as am I. We were determined to restore the property's native flora. Bettine was, among other volunteer jobs, a devoted docent at the Botanic Gardens until she passed in 2010. I am passionate about weeding out invasive species and work fervently to maintain a very large collection of native plantings at the house. Many of the plants came from the Garden Growers nursery. 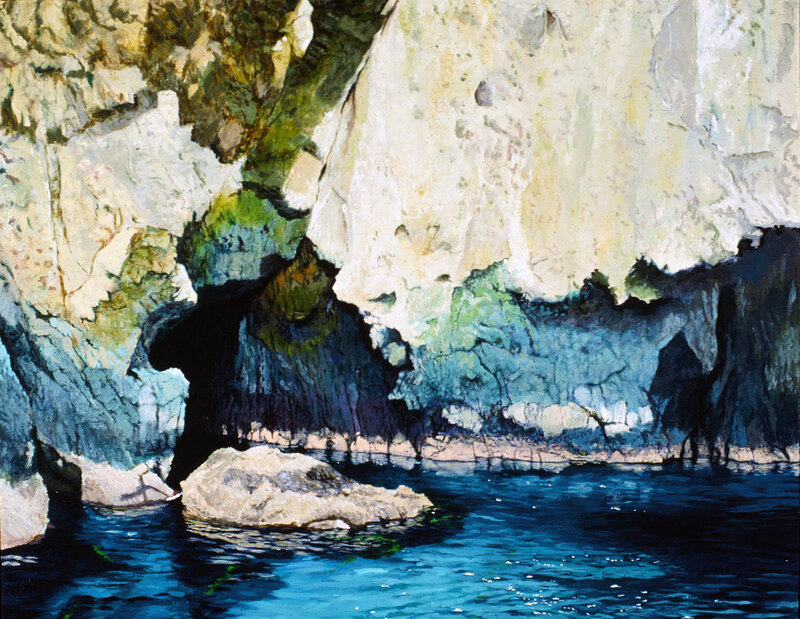 Anacapa Sea Cave Acrylic on Canvas | 40" x 50" The Channel Islands coastlines are wonderful places to explore. I discovered this particular sea cave on an expedition that included both Santa Cruz and Anacapa islands. I was inspired by the shimmer of sunlight on the brilliant blue ocean, reflecting on the sea cave walls. Bettine in Her Garden Acrylic on canvas | 20" x 24" Bettine surrounded by plants, native and alien, that we planted and cared for over many years. A lovely reward for the work. 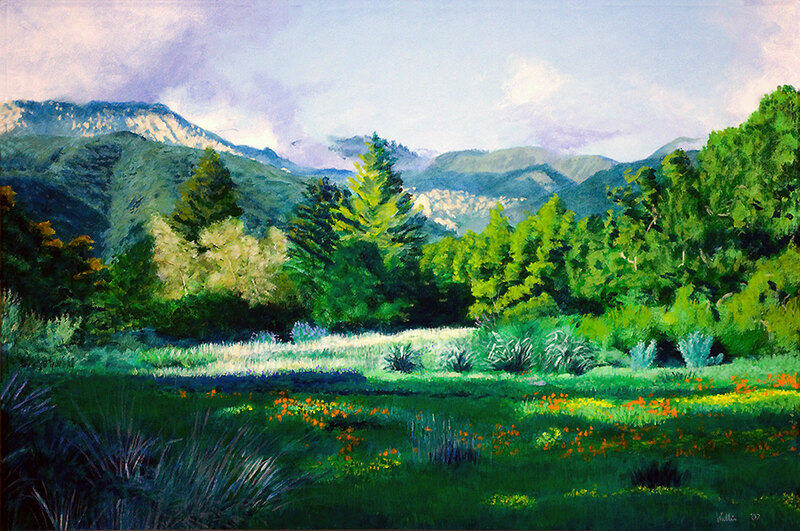 Santa Botanic Garden Meadow Acrylic on canvas | 20" x 30" The always changing meadow in changing weather. 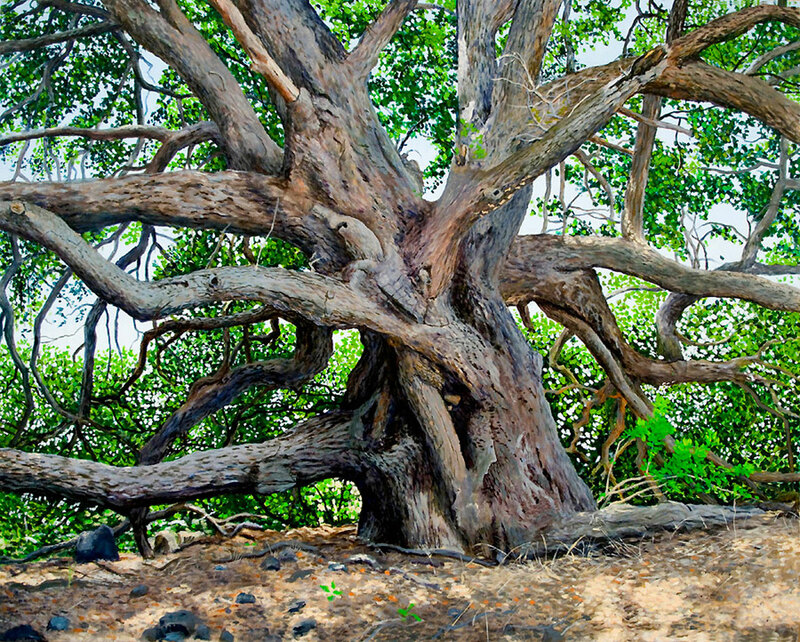 Great Coast Live Oak Collector-quality print on canvas | 32" x 40" I was on Santa Cruz Island with a group of artists for a 3-day painting trip. Each day we would scatter to different parts of the island. Most artists headed to the coast. I walked inland and up a hill. Coming back down, I walked along a dry, seasonal stream bed. When I came out under this wonderful Coast Live Oak, Quercus agrifolia, I knew I had found what I was unknowingly looking for. For the next 3 days I painted and photographed this giant oak. I painted 7 plein air studies and later, in my studio, completed a big, 4' x 5', painting. 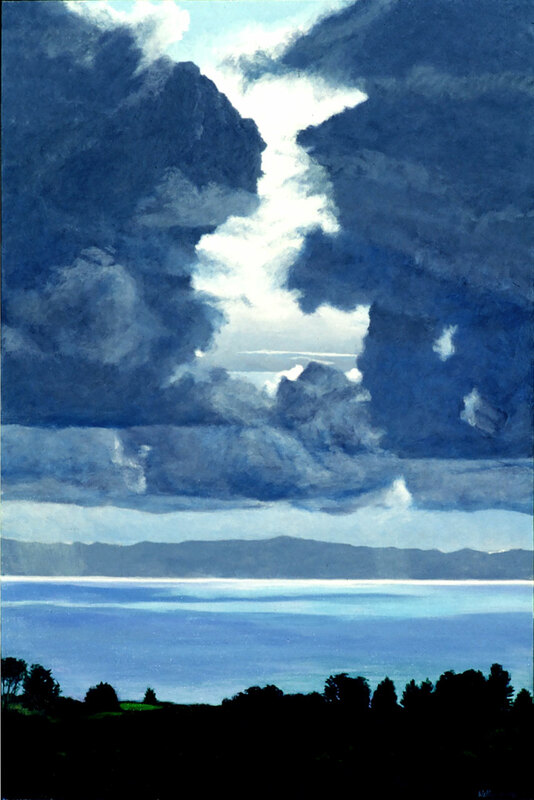 The original, an acrylic on canvas, sold right away to an avid collector in Santa Barbara. I worked with a master printer to create limited edition, archival prints of the painting, so the image would be available to more people. Leaving Santa Cruz Acrylic on canvas | 20" x 60" A sparkling day, fresh wind and beautiful views of the island, marvels enough to overcome my tendency to sea sickness. Rain Over the Channel Acrylic on canvas | 36" x 24" The channel view from my home. Sometimes the clouds cooperate and display their loveliness in dramatic fashion. Vernal Falls Acrylic on canvas | 90" x 65" Vernal Falls in September, before the rains. 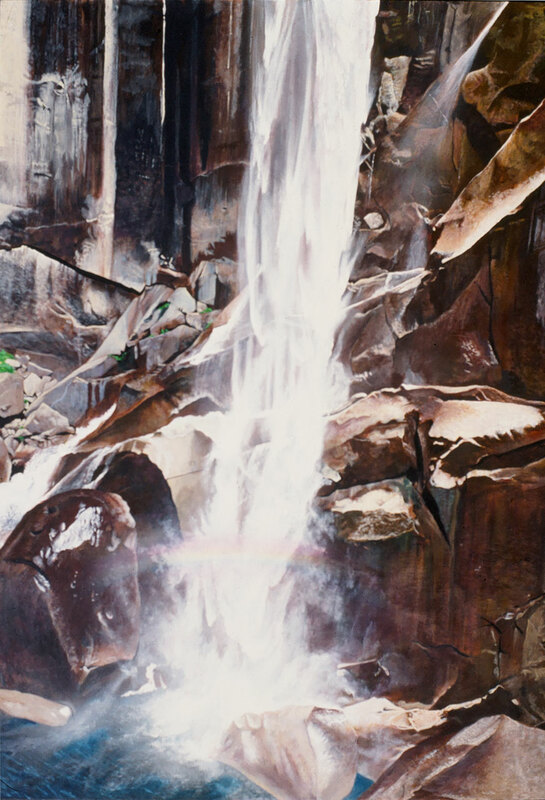 The prisms of Vernal Falls glisten even when the flow of water is at its lowest. 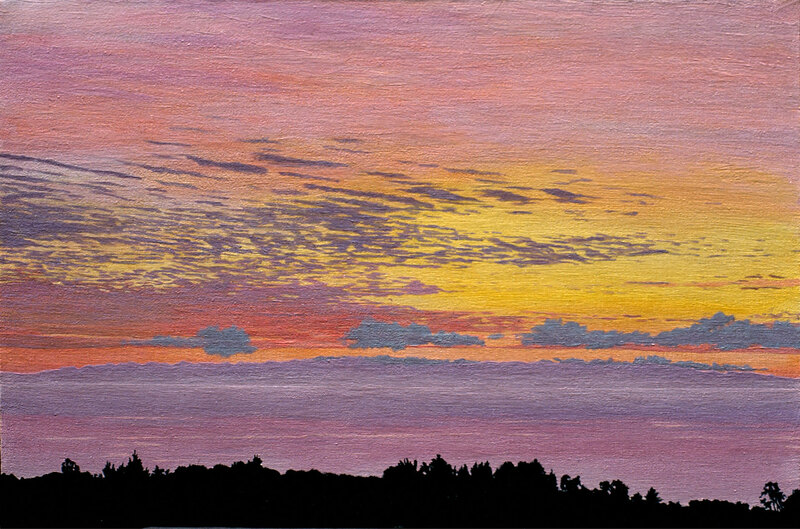 View of Santa Cruz Acrylic on Masonite | 24" x 36" A view of Santa Cruz from my home, during a beautiful sunset.